“The Hockey Song” is a simple, straightforward ode to “the good ol’ hockey game,” with a catchy sing-along chorus that latches itself in your unconscious and doesn’t let go. It is simultaneously a charmingly hokey Canadiana folk song, with its twangy riffs and lyrical simplicity; and an anthemic, arena-sized rock song that is virtually guaranteed to get 15,000 hockey fans singing along together in a packed stadium. In this sense, it manages to symbolically bridge the paradox of hockey’s mythologized representation as a rural game emerging from the frozen Canadian landscape, evoking images of frozen ponds and ramshackle small town rinks, and its contemporary reality as a multibillion dollar, transglobal entertainment industry. If we are to believe Roch Carrier’s assertion that “hockey is life in Canada” (and that’s a big if), then it only makes sense that we explore how the game materializes in art and culture. . . . Popular music, like sport, is a way that we, as a nation, tell stories about ourselves. In the melodies, rhythms and lyrics of songs by Canadian artists, we expect to hear about experiences of Canadian life that are not much different from our own. Given the cultural prominence of Canada’s “national sport,” it is not surprising that hockey has been a fruitful source of inspiration for many Canadian musicians. 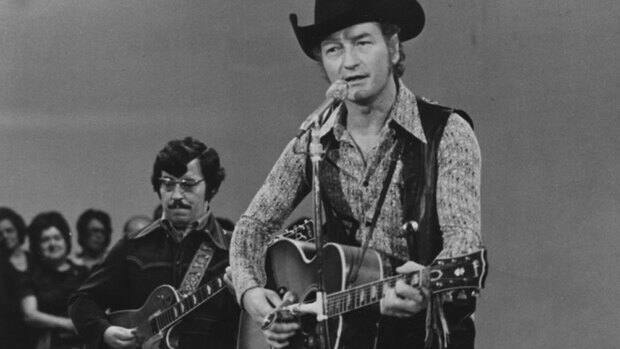 The Canada that Tom Connors sang about was the real Canada of his heyday, and his nationalism not exclusionary – his label, Boot Records, released albums by first-nations artists and reggae groups. But his main subject was a rural, regional, resource-based Canada. Today it’s a transformed country, which sure could use its own large-hearted, peripatetic singer to bring us the news from Rexdale strip malls and Fort McMurray oil fields alike with a bouncy hook. There are few comparisons to Tom as an artist; even fewer to him as a person. As a musician, he was important in the way that the Ramones or the Velvet Underground were important. He was deeply original; his songs were easy to play; and his work triggered the awakening of a people. In Canadian terms, he was more punk rock than punk itself. In 1978, he burned the remaining copies of Gumboot Clogeroo and gave back his 6 JUNO awards as a protest against the greater Canadian music industry’s treatment of Canadian artists; pandering, as they did, to American and British soundalike bands and encouraging groups to supplant Canadian place names with American locales. As a figure in contemporary pop music, no one dared risk expressing defiance and anger the way Stompin’ Tom did; this coming at a time when it was all about “making it” and “wooing American radio” and getting to the Grand Old Opry. Tom stuck his neck out, and it got stepped on. Or stomped on. But these strong bones we used to build the music of a young nation. “The Hockey Song” is hardly a protest song, but it is a nostalgic celebration of the sport that was written at a time when hockey’s cultural prominence in Canada was being significantly eroded. “The Hockey Song” was released in 1973, a time period at which hockey was undergoing massive changes. The NHL had expanded in 1967 from six to twelve teams, and the placement of new franchises in US cities such as Los Angeles, Oakland, St. Louis and Philadelphia signaled the league’s motivations: move into large, mostly American markets, to grow the business of hockey and increase profits through franchise fees, box office receipts, and television deals. By 1973, when “The Hockey Song” was released, the NHL had 16 teams, of which only three were based in Canada. The myth that hockey was “Canada’s game” and that the NHL was a protector of this national interest, a myth that had been slowly eroding for decades as the NHL decimated Canada’s amateur hockey system and continuously placed profit ahead of all other concerns, was truly and spectacularly dead. “The Hockey Song” evokes a nostalgic understanding of hockey that is entirely divorced from the economic and geographic realities shaping the sport in the early 1970s. It’s introductory lyrics, “Hello out there, we’re on the air, it’s hockey night tonight!” conjures up images of Foster Hewitt’s colourful radio broadcasts reaching English Canadians from coast-to-coast (or, for French Canadians, Radio Canada’s René Lecavalier). Meanwhile, the constant reference to hockey as “the best name you can name” speaks to the national prominence of hockey in Canada for most of the twentieth century, a prominence that began to decline and fragment in the 1970s for a variety of social and political reasons. Although it locates itself in the NHL by mentioning the Stanley Cup, the narrative’s lack of reference to a specific team allows it to be interpreted as involving any Canadian hockey team from British Columbia to Newfoundland – truly a representation of the sport as a nationwide pastime. At one of the first games I took my oldest son to, the Preds played “The Hockey Song” during intermission, and my then-5-year-old had a grand old time singing along with the crowd. I don’t remember who the opponent was that night, or whether the Predators won. . . .
Freaking magic moment, that was. Explaining the singer’s legacy to my blank-eyed kids on the morning after his death, I explained: “You know: the guy who does the hockey song!” Soon, they were walking around the room singing it. And so there was no finer a tribute to no finer a man. Clearly, although Stompin’ Tom is no longer with us, his cultural legacy will continue in Canada and within hockey cultures. ← Promoting Grassroots Participation while Building the Brand: To What Extent are NHL Teams Community Institutions?